With my Spurs hat on: Damn. Damn and blast. This wasn’t supposed to happen. I don’t know what was supposed to happen – Rafa’s head exploding, Stevie G the sniper in the Kop? – but I do know that this wasn’t it. Very disappointing. To be honest, I have no idea how we’re still in fourth place, and without wanting to sound too pessimistic, I don’t expect us to be higher than sixth come the end of the season. With my neutral hat on: This was a huge win for Liverpool, one which kick-starts their bid to finish fourth and get back into the Champions League. And they fully deserved it. They wanted to win more than Spurs, who gave one of their infuriating “Can’t be bothered to compete for the ball” performances, the like of which they usually reserve for games against Man Utd. Still, on the plus side, I have Dirk Kuyt – who scored both goals and should have had a hat-trick but missed a sitter, as he does now and again – in my fantasy football midfield. Silver linings etc. I thought Albert Riera was excellent too – he gives Liverpool balance. 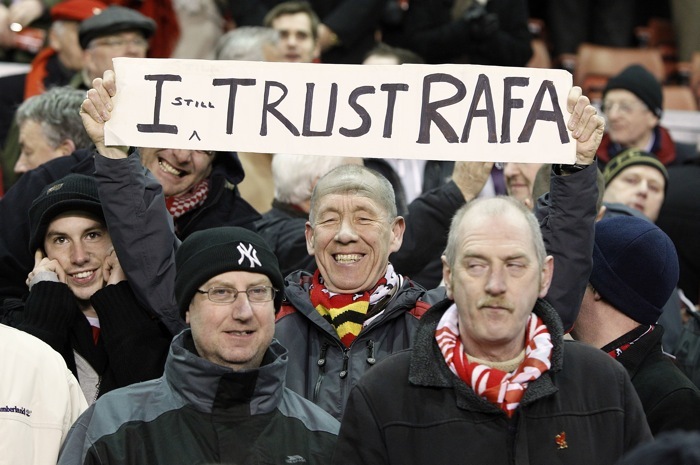 The Kop sang Rafa’s name too. There’s life in the Spanish Waiter yet – time and time again his players pull out a performance when their gaffer most needs it. That’s no accident. Liverpool deserved their win against a very lethargic spurs side but my thoughts are it is simply papering over the cracks. The media would have you believe the crisis is over but in truth its far from over there are much deeper problems at analfield that a home win cant disguise.Keep up the good work Mr.Hicks. if albert riera hadn’t been injured until now we’d probably be in fourth already, certainly no higher mind. an under-rated player. certainly better than that irritatingly unfulfilled potential donkey man tempestually ambling towards the corner flag then falling down Ryan Babel.